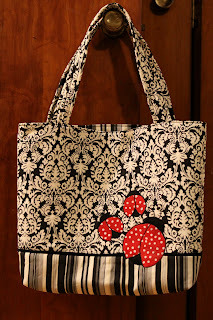 Quaint and Quirky: Flamingos and Ladybugs and Bags - Oh MY! Flamingos and Ladybugs and Bags - Oh MY! My husband's coworker wanted some special presents for family members, so she asked me to create some bags for her. The first one is for her aunt (I think) who has battled cancer. She has taken the ladybug as a symbol of hope for herself. So, a ladybug bag it is! The second one is for her grandmother who LOVES flamingos! Great idea for a fun gift! I used the satin stitch on my sewing machine to applique my flamingo and ladybugs. Please disregard the Christmas header. I thought I had saved my old template, but actually I hadn't, so it isn't an easy restore. : ( New look coming! Soon I hope! Super pretty! 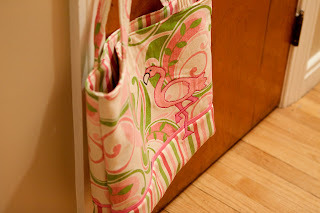 What fabric is on the flamingo bag? Lovely bags. All the recipients are really going to like them. Great job! Loooove these bags! I'll be needing a new one fairly soon. You did so well with the appliquéing*! Was it hard? Jessica, all the main fabrics are from Joann's 45" home dec line. They made a very sturdy bag! Sarah, it wasn't hard, but I've practiced a lot with the name pillows I've been doing. I was NOT good at it when I first started! Your new blog backgrounds look great Kerri! New look for the New Year! those bags look really lovely, great work!!! wish i was good with sewing! I love the bags, especially the ladybug one (but then I am hooked on ladybugs, hence my blog www.ladybuglocker.blogspot.com. these bags are adorable!! i especially like the colors on the flamingo one.